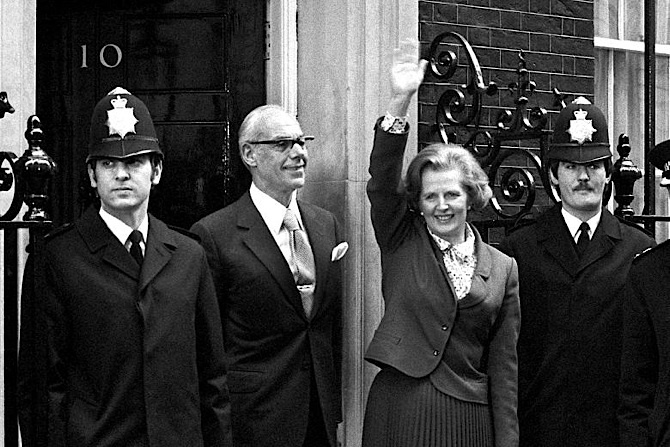 Thirty-four years ago today on 4 May 1979, Mrs Thatcher took office as Prime Minister. Every new Prime Minister, upon taking up the office is given a detailed brieifng on the most urgent and important issues of the day. For convenience here is the briefing on my own website (35Mb pdf download). Here is the document on the National Archives website (where you have to “add to basket etc.”). Public sector pay, energy policy (coal and oil particularly), industrial relations, Europe and international security all feature but so too, of course does Scotland. Here are some highlights. (v) Constraints on industrial development caused by planning procedures (the CPRS are conducting a study) – with Moss Morran as the current leading case. 4. For Scotland your Scottish Manifesto also proposed the early establishment of a Select Committee for Scottish affairs. 6. The outcome of the referendum can be accounted a rejection of an elected Assembly with legislative and executive powers for Scotland alone …… Although a federal system for the United Kingdom as a whole, with parity of relationships for each of its parts, could accommodate a Scottish legislative Assembly, there is clearly little interest in and less demand for so fundamental a change in the country as a whole. And on the lack of readiness of the rest of the UK to embrace constitutional change foundered the hopes of home rule for the next twenty years. Ironic isn’t it that without wanting to Thatcher has probably done more than most to move Scotland towards independence! So they managed to convince themselves that a majority vote in favour of devolution was actually a show of “little interest and less demand”? Thank you for yesteryear’s duplictious example of no jam tomorrow. If and when you can spare the time, I shall be grateful if you could point me at the Holyrood equivalent – if any – of Westminster’s ‘Sustainable Communities’ Bill which Unlock Democracy did the leg work for. Probably the closest thing is Community Empowerment and Renewal Bill I’ve never been a fan of Sustainable Communities Bill because I don’t see the solution to local problems to be to ask a remote central government to do something. This is a symptom that power is not in the right place. Thank you for your response to my request Andy. But for walking the dogs, I wouldhave replied sooner. To my mind – as sovereignty is our very being, in person and plural – it should be lent to tiers of governance that are naturally structured from bottom-up, each tier neither being too big to fail nor too small to succeed in carrying out its responsibilities under public scrutiny and accountability when endowed with sufficient matching authority and resources. In short, I agree that our democracy should see the people/public power being exercised as close as possible to folk and in no way replicating what they can do for themselves and each other in self-same service to our communities of families, friends and fellow folk in our society. My query was to help me rediscover the nature and extent to which bottom-up attainment is or is not replacing top-down imposition in Scotland.